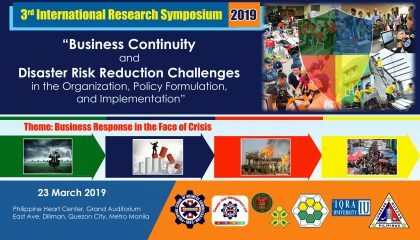 We are pleased to invite participants to the 3rd International Research Symposium (3IRS) entitled “Business Continuity and Disaster Risk Reduction Challenges in the Organization, Policy Formulation, and Implementation” with the theme of Business Response in the Face of Crisis, to be held on Saturday, March 23, 2019 at the Grand Auditorium, Philippine Heart Center, Quezon City, Philippines. 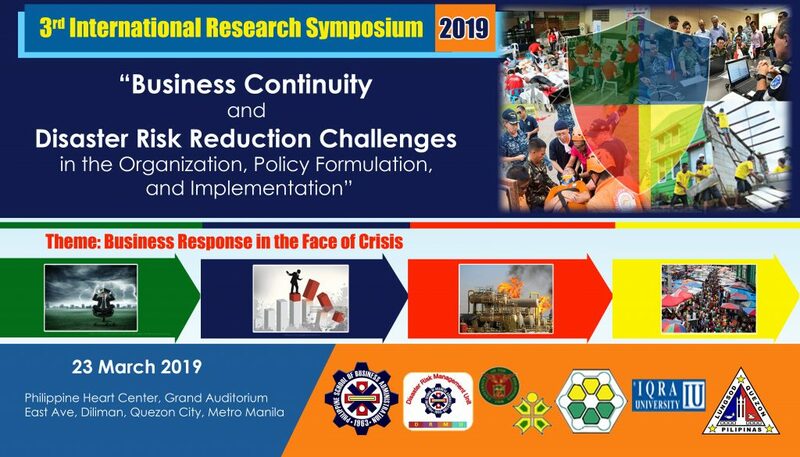 The event is organized by Philippine School Business Administration – Manila and co-organized by IQRA University, Karachi Pakistan; the University of the Philippines Planning and Research Foundation, Inc., (UP PLANADES) and Quezon City Scholars enrolled in Disaster Risk Management Specialization Class of PSBA-Manila mostly from the Quezon City Planning and Development Office (QC-CPDO) and Disaster Risk Reduction Management Office (QCDRRMO). The annual Third International Research Symposium of the Philippines School of Business Administration – Manila (PSBA-Manila) continues its mission from the School’s First Symposium and Second International Symposium, as well as its Three International Research Colloquia, where PSBA-Manila’s Research Fellowship Program’s Research Fellows, students and experts from the local and international institutions, its local and international partner schools, and its local and international public and private organizations and partners, have contributed their knowledge in this unique platform particularly disseminated with focus on business continuity and Disaster Risk Reduction challenges. Registration fee is USD 50.00 for Students (must provide copy of Student ID Card) USD 75.00 for Faculty or Professors (must provide ) and USD 100.00 for all other Participants / Professionals / Practictioners and Attendees. Registration fee includes 3IRS Symposium Kit, Participation Certificate, Digital Proceedings (will be available Online after the Event), Lunch, Morning and Afternoon refreshments. No Travel and Accommodation included. Interested participants can fill up the Registration Form here. Registration Fee is waived for PSBA Students, Faculty, Professors and Staff, as well as Invited Speakers and Observers. We are also inviting interested researchers, technical experts, and resource persons to participate as Resource Speakers to present in this event. Interested Resource Speakers should submit their abstracts through the Registration Form. The outcome of the Research Symposium will be published as Proceedings containing Resource Speakers’ presentations and Abstracts of all the papers that will be presented in the Symposium. Abstracts must be submitted through the Call for Abstracts form. Abstract should be proceeded by the title of the paper, Thematic Area, the name(s), institutional affiliations of the author(s) and contact detail. Abstract should be written in English using MS Word format. Abstract text must not exceed 300 words. Deadline for Abstract Submission is February 22, 2019. We will contact the corresponding author if your Abstract is accepted by February 24, 2019. For any difficulties to upload Abstract please send an email to inggo@psba.edu. Corresponding author is responsible for informing other authors about the status of the abstract. Once your presentation is accepted, you must Register to the Symposium under “Accepted Abstract”. Presented Abstracts will be compiled into proceedings of the 3rd International Research Symposium.